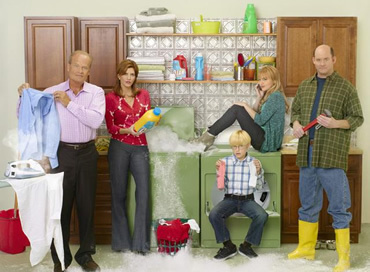 Performers include: Kelsey Grammer, David Koechner, Melinda McGraw, Jordan Hinson, and Nathan Gamble. Hank Pryor (Kelsey Grammer) is a highly-successful sports retail entrepreneur in New York City. His life changes dramatically when he’s forced out as CEO of the company he built and has to downsize and move his family back to the small town of River Bend, Virginia. It’s a struggle for Hank. He’s lost nearly everything and, after so many years with the upper crust, doesn’t know how to mingle with the little people. Tilly Pryor (Melinda McGraw), Hank’s wife, deeply regrets having to leave her high-society life in New York City but is committed to making the best of it. Her brother, small-town contractor Grady Funk (David Koechner), is there to help but really enjoys that Hank has fallen from his lofty pedestal. He tells Hank that, if there’s anything he can do for him in his time of need and failure, to just let him know. Neither Tilly nor the kids are used to having Hank around the house. In many ways, they’re virtual strangers and getting to know one another turns out to be the biggest adjustment of all. Not funny. Please see that this horrible-horrible steaming pile is cancelled. Get rid of the awful laugh track! I am a fan of Kelsey Grammer but this show is just not funny. I also find him miscast in this role. Why not do another Fraiser spinoff? This time revolving around around his move from seattle to find true love. Sounds much more interesting than HANK. I watched the first ep, and found Kelsey Grammer completely miscast in this role. He’s too stiff, trying to play “everyman”, which he isn’t. He has yet to top Frasier, which soared with some of the best writing ever using laughable situations, not resorting to mean-spirited or foolish dialog. Back to You had some of the same problems as Hank. Kelsey should try again. Give it a chance, I have seen much worse.